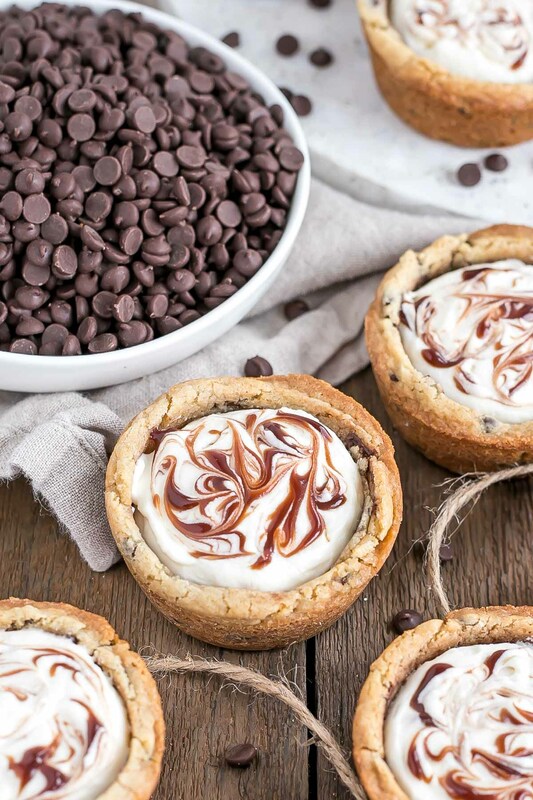 These chewy Chocolate Chip Cookie Cups are truly one of the easiest desserts you’ll ever make. 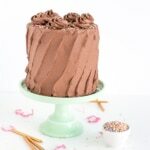 Filled with vanilla cream cheese mousse and a swirl of chocolate sauce. There are few things better and more comforting than good old chocolate chip cookies. Especially a batch that’s just come out of the oven and you grab a cookie as soon as it’s barely cool enough to hold and devour. One of life’s little pleasures, for sure. 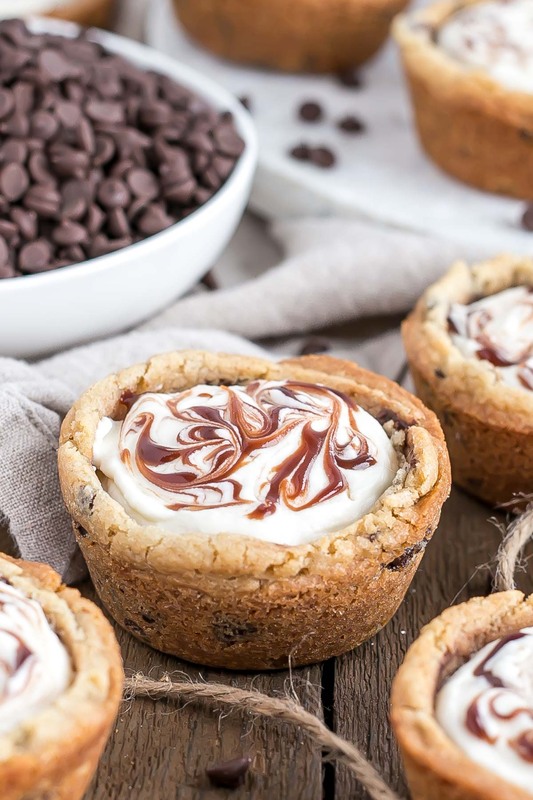 These delicious Chocolate Chip Cookie Cups made their debut last weekend at a Food Bloggers of Canada potluck get-together hosted by my good friend Sam of My Kitchen Love (seriously, check out her stuff, it’s both stunning and delicious)! I typically tend to shy away from social events, especially ones where I don’t know most of the people, but I promised my friend Sam I’d be there, so be there I was. Cookie Cups in hand! In hindsight, as always, I’m really glad I went and I got to meet a few new fellow food bloggers. Overall it was a super fun evening filled with delicious food. Why on earth would I have said no to that?! 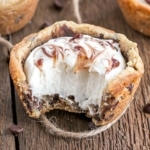 Like my other cookie cup recipes, these ones are really simple to make. Like, SO simple. 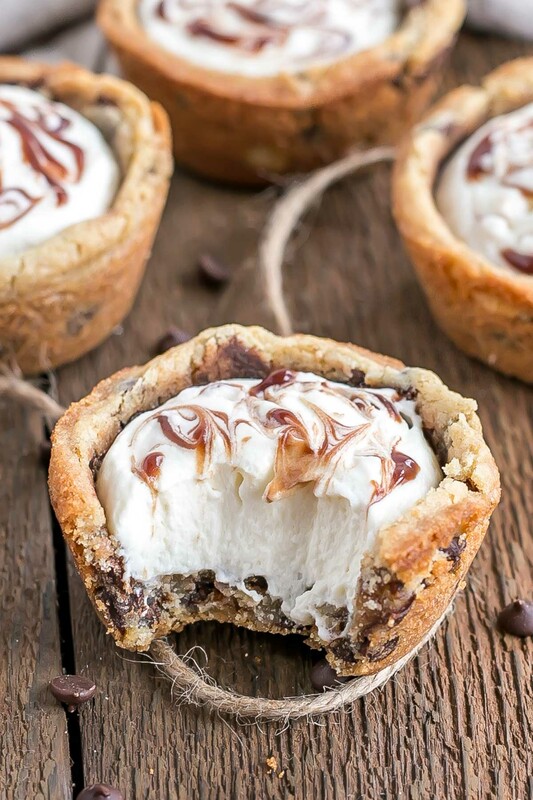 Whip up some cookie dough, bake it in a muffin tin, and press down on them as they come out of the oven to create the cups. The filling is just as simple. Whip up the cream cheese & sugar and fold it into some whipped cream. Fill the cooled cookie cups and you’re done! Ideally you’d chill them in the fridge for an hour or two to thicken the filling, but this is totally optional and not at all necessary. It really just depends on how you like it. I prefer them out of the fridge, but I certainly won’t turn my nose up at them if they’re at room temperature. 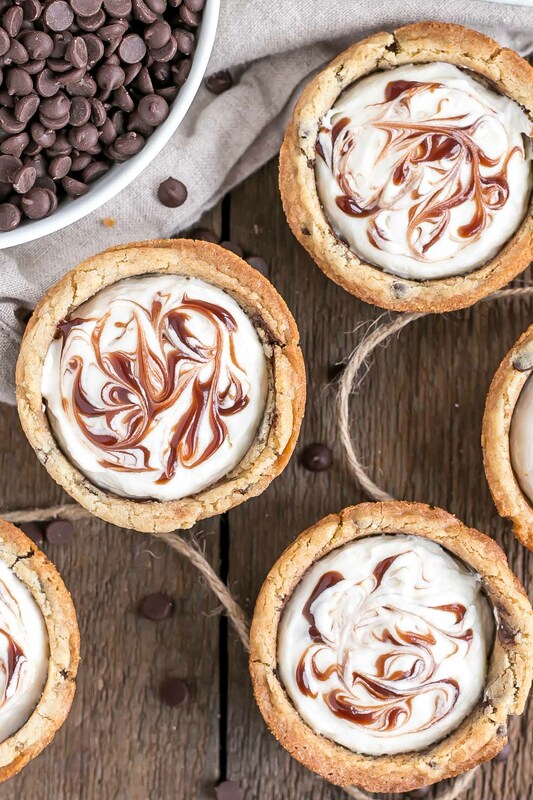 The best thing about these Chocolate Chip Cookie Cups? They freeze really well. 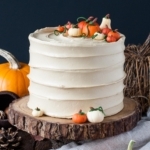 So you can make them in advance for a special occasion, or just have an easily accessible treat for yourself stashed away. We all need those from time to time, right? 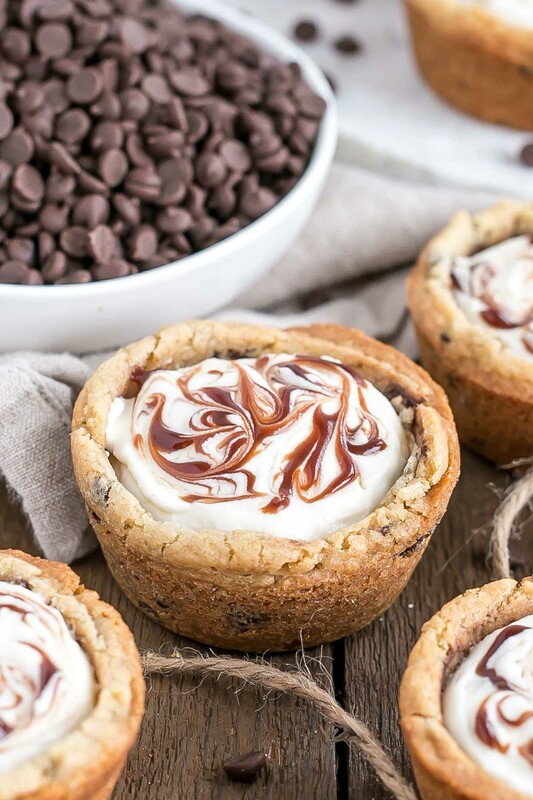 I honestly did not think it was possible to make chocolate chip cookies even better, but these Chocolate Chip Cookie Cups have done it. 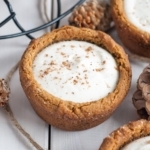 Pairing the cookies with a fluffy cheesecake mousse gives them just the right balance of sweet and tangy. The cream cheese flavour isn’t strong, but it really helps intensify the flavour of the cookie cups. Use sea salt in your cookies if possible. It really enhances the favour! These freeze very well! Store in fridge for up to 4 days or in freezer (in an airtight container) for 1-2 months. Best served cold, but can be served at room temperature. 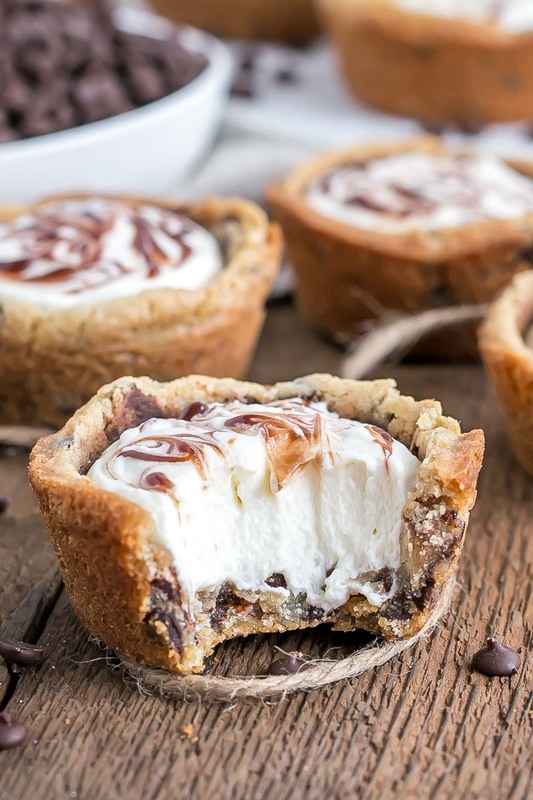 These chewy Chocolate Chip Cookie Cups are truly one of the easiest desserts you'll ever make. Filled with Vanilla Cream Cheese Mousse and a swirl of chocolate sauce. Beat butter and sugars on med-high until pale and fluffy (approx. 2-3mins). Reduce speed and add eggs (one at a time), and vanilla. Beat until combined. Add flour mixture and mix until just combined. Fold in chocolate chips. Using a large cookie scoop (3 Tbsp), scoop dough into muffin tins. Bake for approximately 15 mins or until lightly browned and mostly set (but not completely). In a separate bowl, beat cream cheese and sugar until smooth, add vanilla and beat until smooth. Fold cream cheese mixture into whipped cream. Pipe into cooled cookie cups. 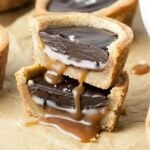 Top with chocolate sauce if desired and swirl with a toothpick. Refrigerate until set (approx. 2 hours). I finally got around to making cookie cups, but I made these as mini ones instead (I got 50 of them, but probably could have still gotten another couple out of the last scraps of dough). I did a heaping tablespoon of dough in each cup, baked them for 10-11 minutes (watch very closely, I think I wound up doing the second pan as 10:30) and used the back of a metal teaspoon to squish down a little well. I took them to a family gathering tonight and they devoured them! I had two people ask me for the recipe already. It’s the perfect balance. I thought the cookie on its own was a touch salty, but that wound up going very well with the chocolate and then the tangy sweetness (that’s not TOO sweet) from the filling. Can’t wait to try others! Hi there! Yes, they freeze well. Can I use liners in the tin? 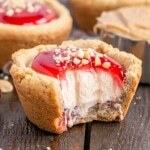 I have tried different cake/cookie cup recipes before and I always have trouble getting the cups out of the tin. Hi Lauren! I don’t see why not, definitely give it a try! Olivia, I love caramel, so I did them in the mini muffin pans, after shaping with a shot glass I added a caramel to the bottom and then topped with your frosting! Really an extra treat!pwitha surprise! Hi Donita! That sounds crazy delicious, I love that idea!! Can cool whip be substituted for real whip cream? These. Are. Amazing. Took them to a tailgate at my son’s college. 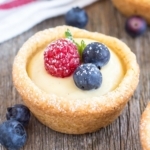 In making the cheesecake filling, vanilla is called for, but it doesn’t say where to add the vanilla–I added it to the cream cheese/sugar mixture before folding into whipped cream. The college kids devoured them!!! Thank you! Hi Janet! Oops, good catch on the vanilla, I’ve updated the recipe. So glad everyone liked these!! Can the muffin pan be turned upside down and form the dough on the outside of each cup? Thanks! Hi Suzy! I’ve never tried this myself but you can give it a go. Let me know how it turns out! Hi. When you say these can.be frozen for up to 4 weeks do you mean with the filling or the empty cups. You didn’t specify. Hi Murjan! They can be frozen with the filling. Hi Michele! Adding Nutritional Info to my recipes is on my list of things to do. Stay tuned! 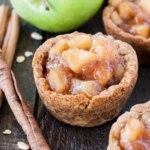 Have you ever made a cookie cup using a mini muffin tin? I like to make mini cupcakes, etc., so people can try my dessert and other desserts and not feel so guilty. I think these would make great mini cups, but wonder if you have tried it. If so, how long did you cook them, etc.? Hi Connie! I’ve never made them in mini muffin pans myself, but it should work fine. I’m not 100% sure on timing. Start checking at 5-7mins and bake them until lightly browned on the edges. Let me know how they turn out! I just made them in my mini tin pans. I got 51 out of the cookie mix. I baked them for 11 mins. Turned out perfect!! I also use my wooden press from Pampered Chef that I bought over 20 yrs. ago to press down the cookie. Came out clean. Great recipe. Very Easy! Will definitely make again. Thanks so much for the input Michele! So glad you liked them 🙂 That wooden press is perfect! I’m totally going to look for that. Thank you! Yeah, this recipe didn’t really work for me. I cooked them for fifteen minutes as recommended, but when I tried to press the cookies down with a glass jar they fell apart. The dough in the center hadn’t cooked at all, even though the outside looked perfect, if not slightly overdone. I wound up pressing the rest down with a spoon and putting them back in the oven. Even then, they were pretty raw and had a sort of eggy flavor that I didn’t really like. The whipped cream was really good though. Thanks for the recipe anyway. Hi Emily! So sorry to hear these didn’t work out for you 🙁 I find I get different results depending on the color of my cupcake pan. Darker pans can cause the outside to brown rather quickly! Another culprit could be oven temperature. Some ovens run hotter than others and can cause things to bake/brown quicker. The center should be somewhat gooey, but not raw, when you press down. If it’s raw I usually pop them back in the oven for a couple mins. I would say that I do like mine somewhat underdone and chewy, but it’s a preference thing. Glad you liked the filling! They taste even better than they look. They were so easy to make. I took them over to a family party and everyone was crazy about them! This was the first time trying your recipes and I can’t wait to try them all! Thank you! Hi Tina! So happy to hear you guys liked these 🙂 Thanks for the feedback! Hi Oyu! Yes, just a normal sized cupcake tin. 12 per pan. I hope you like them! Hi Olivia! with the extra dough can we make cookies with it? Hi Katie! I didn’t have any extra dough, but if you choose to make less cups then you can totally make cookies instead! Can I use caster sugar instead of granulated sugar. Because I don’t have any. I really want to make them they look amazing! Hi Lillyanne! 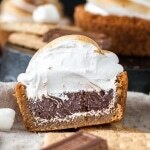 I’ve never tried making these with caster sugar myself. I think that *should* work ok. Caster sugar is a bit finer than granulated, so ideally you’d go by weight if substituting. The cookie cups didn’t turn out for me-the glass I used after baking to form the cups pulled out the cookie dough so I thought they must have been undercooked. However had another tin that baked longer and then didn’t accept any shaping. Salvaged the dessert by crumbling half the cookie crumbles in a 9×13 cake pan, topping with filling and the remaining cookie crumbles. It was a major hit anyway- my granddaughter requested this as her birthday dessert. 😎 Anyway, please pass along any suggestions if anything comes to mind. Thanks!! Hi Connie! Sorry to hear about the troubles with sticking 🙁 I use a plastic cap from my Pan for Baking to press into the cookies. It sticks a bit at times so I try to spin it in the cookie cup or sometimes hold onto the edge of the cookie (through a tea towel since it will be hot) while pulling it back up. You could try spraying the glass with some cooking spray to see if that will prevent it from sticking. Or try something metal if you have it handy — like a cookie scoop or even the back of a spoon maybe. Let me know if any of those work!! Hi Adina! No, you should use butter in the cookie cups. Bizarre! Are you on mobile or tablet? If so, look for a Read More button. I hope that helps! I used premade cookie dough for times sake. You have to use the ones that are 12 in a pack. You also have to make sure they’re cooked really well before you try to shake them and then leave them in the tin to cool completely to keep their shape. I am so drooling over these! Gorgeous desserts! These look so good! I wish I had been at the potluck just so I could have snagged some of these! I’m exactly the same with social events. I’ve yet to meet any of my fellow food bloggers and I can’t wait for the opportunity! Oh sweet lord. I cannot BELIEVE how stinking good these look. I mean the cookie is one thing, but then you add that filling? Swoon. They are amazing!! I promise 🙂 I hope you try them! Oh crap, what the heck?! Thanks for catching that, Peggy. I’ve updated the recipe! In a million years I could never attempt this, but I very much enjoy reading about your creations. I wish you lived next door to me, not 4000 kms away ! Do you press the cookie dough down into and up the sides of the tin? Hi Rebecca! I don’t because I prefer the way they look after they bake up when I leave them in a mound. You can certainly do that though! They likely wouldn’t need as long to bake if you did. We’re can I get the recipe? Hi Linda! The recipe is in the post. Are you not seeing it?